It was late in the evening on a weekend. I was up alone. My mind was fried. I had no initiative for creative work of any kind. I flipped through the Netflix pages and found From Time to Time, where the description talked about time travel. Time Travel! I am always ready for a good time travel story. So I watched it. Tolly, a British teenager returns to his ancestral home for a long vacation in 1944, towards the end of World War II. His grandmother thinks that his father had died in the war, but the boy does not believe it. He senses his father is still alive. As he explores the old house, he finds that he can mysteriously travel between the present and the 1700s, or the people that lived in the house in the 1700s overlap the present like ghosts that only Tolly can see. He communicates with the ghosts and actually interacts with them. This helps him unlock family secrets that have been sleeping for centuries. 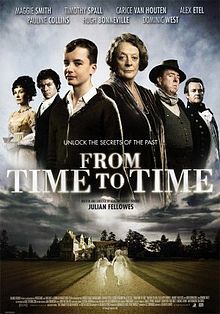 From Time to Time is a dry and slow ghost story, just interesting enough that I kept watching, but not good enough that it mattered that I didn’t quite follow the full plot. When it was done I realized that I’d hang on to the memories just long enough to write this review. You write some of the most gorgeous reviews, even for the not-so-gorgeous movies. Wow, that’s nice to say. I think it’s important to try to find something meaningful to say for my readers, right. I have a policy to review every movie I watch, so it motivates me to pay attention while I do it. Also, I can search my blog when I forget whether I saw a movie or not. It’s always there.